Today we’ll look at some smart solutions how to hide that artifact from the players eye. Big boats usually don’t have this problem – at least if you’re standing on deck or the camera shows the ship from the outside. In these cases you can’t see into the ships “belly” and wouldn’t notice the water-plane. But one day I saw this funny bug-video recorded from Back Flag which shows really obvious, that the developers actually pushing the water away below the boat! Source: AC IV Black Flag – VERY FUNNY BUG – Ship rising out of the water. 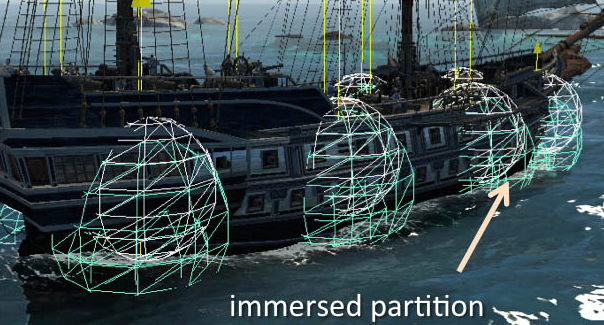 Full detailed collision detection with fluid dynamics and rigid body interactions would be impossible in realtime, but it is effectively simulated by the use of multiple partitioned boxes or ‘buoyancy spheres’. 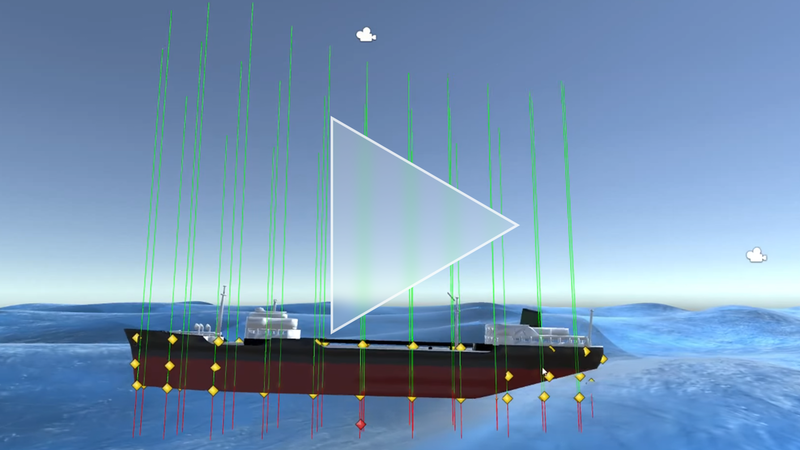 “The buoyancy spheres are probes used to measure the velocity of the ship entering the water at that location, it tells the particle splashes when and how big to spawn. Anyway, the engine does an impressive job with that simulation – but something else catched my attention during the investigation. It was the small boats in the game. Sure, if your boats are damaged anyway they are allowed to be filled with water like below. Bot let’s look at solutions to this issue without having to physically simulate all the water! Inspired by the big boats you can add some geometry to the boat to hide the inside of the “belly”. So the water actually is in the boat but as long as it is not higher than the added geometry nobody will notice. Job done. Arrrr! Now back to the boat in Black Flag. Clearly the water-plane is high enough so than we should see the water in the boat. If you would not draw any water, the wave would have a “hole” where the lid-geometry of the boat sits seen from the pirates point of view. You first render your terrain, pirate, boat, etc. and then – and this is the secret weapon here – you draw the invisible plane but you draw it only into the depth buffer! Now you can render the water-plane which will only be visible in those areas which aren’t already obstructed (based on the information in the depth buffer). 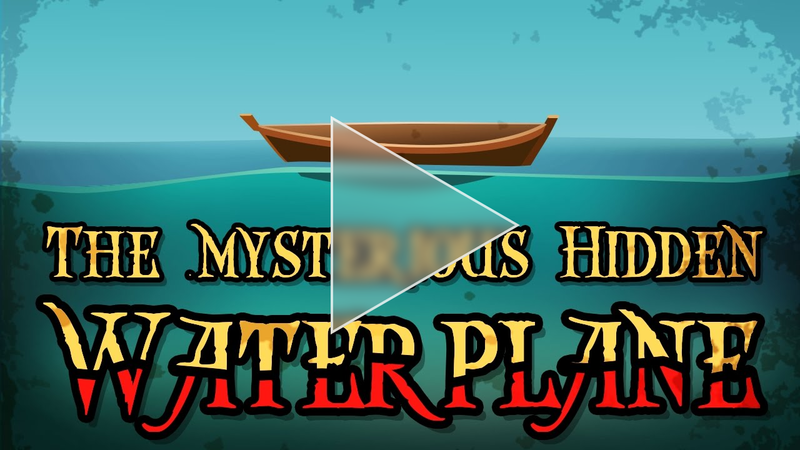 There’s no water and no invisible plane (you can see then inside of the boat in the depth buffer). Invisible plane is rendered into depth buffer. Now you can’t see the inside of the boat in the depth buffer. No new pixel below the invisible plane will be rendered anymore. Water is rendered where no other pixels of the depth buffer obstruct it. 2. 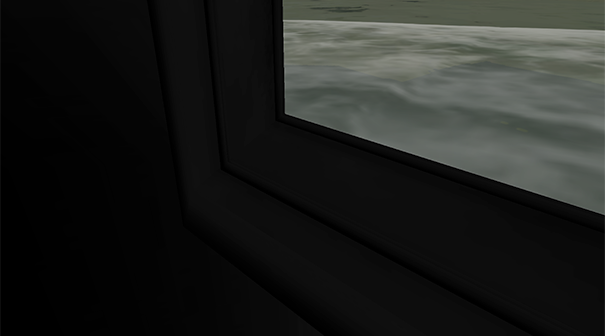 Sometimes you can see foam inside the boat which leads to the suspicion that the water-plane is still there (even if we can’t see it) and the logic reacts the to player spawning foam. 3. When we disable the draw call, which draws the magic lid-geometry, it looks like below. Look at this, I guess we’ve found the water! In Battlefield 2 you could have these amphibian vehicles where players could sit in the “belly” of the car. This is how it looks when you’re sitting inside this car. As you can see, there’s no water inside which surely makes the soldiers happy. 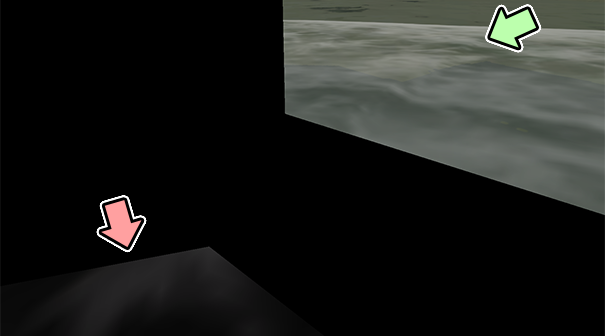 Then the terrain and water is rendered and the mask seems to keep the water out. I really hope you like the new article/video and I would love to hear your opinion, tips, ideas, theories and whatever else you want to tell me. Have a nice day! Felix Jones wrote in his comment about the boat-history of Minecraft. And how his suggestion led to the implementation of a “real” solution instead of the “hidden belly”-approach. Max McGuire mentioned that they use “signed distance field to clip the water from inside the escape pod” in their project Subnautica. This entry was posted in Game Art Tricks on 14. December 2016 by Simon. Hey :) Nice trick and nice explanation. How does the effect that you see in the AC4 bug video work though? Someone told me that a small displacement map is used for this. It pushes the vertices downward. About the masking of the water in the boat, another approach is the usage of a stencil buffer. Stencil buffer is basically a mask (generally 8bits) that you can read, write, increment and decrement that is often use to create portal effects, masking certain objects or even redner shadows, like in doom 3. If the hidden geometry is writing a value to the stencil buffer, let say 1, and the water is rendered after that everywhere except on the pixels that have a value of 1, then you’re good. But, like in an example at article, in the situation with looking on a ship throught a very high wave wouldn’t you discard nessesary fragments and see a hole in wave? Prior to the 1.9 update, boats in Minecraft had a “hidden belly”, which solved the problem of them flooding, until they got too low and then the problem appeared again. There is another technique as well; portals! A stencil buffer can be used in-place of the depth buffer for masking, however this comes with the limitation of the water needing to be a uniform level (no large waves in-front of the boat). The benefit is that the depth buffer is not modified, which may be important for other effects. What do you use to step through draw calls like that? Intel GPA (DirectX) is a good program for that as well as NVidia NSight (OpenGL). GLIntercept as well is a nice tool but doesn’t offer stepping through drawcalls. But it offers (when it works) for example a free debug camera.